There's nothing more impressive than the triple threat, like Hugh Jackman with his singing, dancing, and...there's definitely something else Hugh Jackman does, right? Here to triple-threaten your belly: Bennett Oyster Bar & Brasserie, opening Wednesday in Battersea. This elegantly ambitious project aims to serve as an oyster bar, brasserie, and wine shop, a triumvirate set in a polished space proudly showcasing varnished wood floors, a long marble raw bar, and a vast wooden shelf largely dedicated to vino, plus select brandy, whiskey, and Cognac -- which no matter how old it gets, must always be reassured that it's "very special". 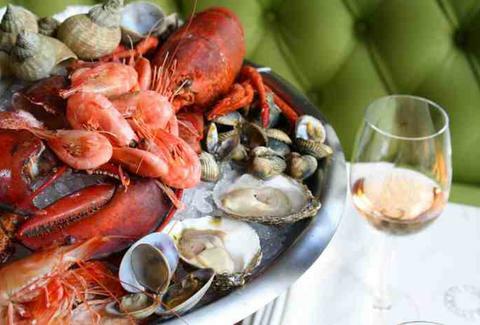 At the casual raw bar, you're invited to overeat dressed Cromer crabs, potted Morecambe bay shrimp, Sevruga caviar w/ blinis & sour cream, and a wealth of strictly British pearl-factories including West Mersea, Jersey, and Scotland's Loch Ryan, not to be confused with Lock Ryan, the tuft of hair you scissored off Giggs before surprising even yourself with how fast you could run. Hit copper tabletops surrounded by green studded banquettes for classic cross-Channel fare like ox tongue w/ foie gras & pickled cauliflower, slow-roast pork belly w/ mustard mash & caramelized apple sauce, lavender & pepper-crusted venison loin, deep-fried skate cheeks, and potted Arbroath smokies, known to laugh hysterically at news reports on the health benefits of sea-weed. The shop itself will be vending fresh-baked bread and organic fruit & veg, but the main thing's the Daddy's-grape-juice, with over a hundred enomatically tastable grape-labels that can be delivered, taken away, or corked at table, from an '07 Meursault Villages Burgundy, to an '05 Chateau Viramiere St-Emilion Grand Cru, to Ruinart Brut Champagne...Ruin Art! That's the other thing Hugh Jackman does!